Has Cognitive Behavioural Therapy for psychosis had its day? Have its benefits been overstated? 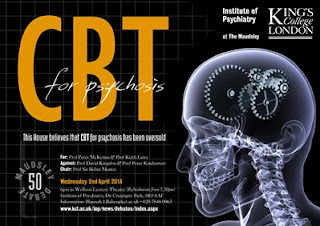 “Has CBT for psychosis been oversold?” is the subject of the next Maudsley Debate taking place today (Wednesday 2 April 2014) with Keith Laws, professor of cognitive neuropsychology at the University of Hertfordshire, debating for the motion. The debate will be chaired by Professor Sir Robin Murray in front of a large public audience – with the presentations also being published in the British Medical Journal. Cognitive Behavioural Therapy (CBT) is a recognised treatment for people with psychosis and is recommended as a treatment of choice by health organisations around the world for people with psychosis and schizophrenia. However, the most extensive study ever undertaken into the effect of CBT on the symptoms of the disorder, published in January this year, found little evidence of efficacy. The international team of researchers, led by Professor Laws performed a new meta-analysis examining CBT in fifty clinical trials involving 3,000 individuals diagnosed with schizophrenia. This new research raises questions about whether CBT should continue to be recommended in clinical practice. The National Institute of Health and Clinical Excellence (NICE) currently recommends CBT as a treatment to be offered to ‘all patients with schizophrenia’ in England and Wales. Professor Laws and colleagues think this recommendation should be reconsidered – and this is the subject of the forthcoming Maudsley Debate. The Maudsley Debates focus on issues that have a direct impact on mental health services, service users and mental health professionals. They are held three times a year at the Institute of Psychiatry, based at King’s College London. Previous speakers include Germaine Greer, Lord David Owen, mental health tsar Louis Appleby, journalist Ben Goldacre, Baroness Mary Warnock and many more besides. 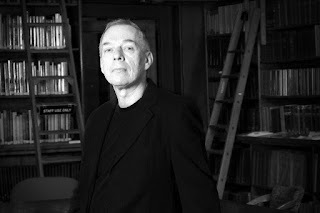 Read Professor Laws' review of why the evidence of CBT as a treatment for schizophrenia is not as strong as some thought at the Guardian online today. Tonight's Maudsley Debate will be available as a podcast after the event – so listen in and make your mind up! So what do you think? Should CBT remain the treatment of choice for schizophrenia and psychosis? Or have its benefits been oversold?